^ Pustet, Regina. Copulas: Universals in the Categorization of the Lexicon. Oxford studies in typology and linguistic theory. Oxford University Press. 2005. ISBN 0-19-928180-7. ^ Sayuri Kusutani. 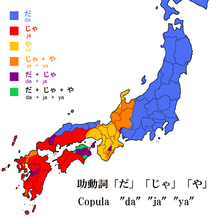 The English Copula Be: Japanese Learners’ Confusion (PDF). TESL Working Paper Series. Fall 2006, 4 (2). （原始内容 (PDF)存档于2008-12-12）. Bram, Barli. Write Well: Improving Writing Skills. Yogyakarta, Indonesia: Penerbit Kanisius. 5 July 1995: 128. ISBN 978-979-497-378-3. Howe, Catherine; Desmarattes, Jean Lionel. Haitian Creole Newspaper Reader. Dunwoody Press. 1990: 232. ISBN 978-0-931745-59-1. Kneale, William and Martha. The Development of Logic. Oxford: Clarendon Press. 1962. ISBN 0-19-824183-6. OCLC 373178.